Congressman Bob Latta talks to five Vantage seniors who are participating in the innovative new high school CDL truck driving program during his visit to Van Wert County. VAN WERT — Rep. Bob Latta visited Van Wert County Wednesday to discuss the economy, vocational training and honoring the men and women who serve in the military. Latta stopped at Vantage Career Center, Braun Industries and Venedocia Memorial Park, where he spoke to student Dominic Adkins about his Eagle Scout project, the installation of a 105 mm howitzer in the park. One of Latta’s Republican primary opponents for the 4th Congressional District seat, Todd Wolfrum, is a Van Wert County commissioner. 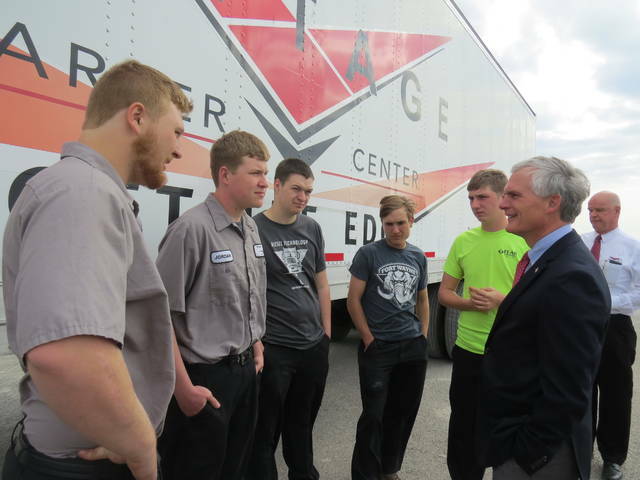 https://www.limaohio.com/wp-content/uploads/sites/54/2018/05/web1_IMG_1798.jpgCongressman Bob Latta talks to five Vantage seniors who are participating in the innovative new high school CDL truck driving program during his visit to Van Wert County.